Scooby-Doo and the Witch's Ghost is a 1999 direct-to-video animated supernatural horror-comedy film, and the second of the direct-to-video films based upon Hanna-Barbera's Scooby-Doo Saturday morning cartoons. It was released on October 5, 1999, and it was produced by Warner Bros. Animation (although it contained a Hanna-Barbera Cartoons, Inc. copyright and logo). The Mystery Inc. gang (Scooby-Doo, Shaggy, Fred, Daphne and Velma) travel to a New England town called Oakhaven after being invited by horror writer Ben Ravencroft. 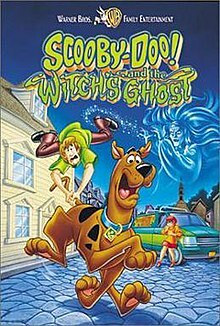 Like a number of direct-to-video Scooby-Doo animated films released in the late-1990s and early-2000s, The Witch's Ghost features real ghosts instead of traditional crooks in masks, giving the film a darker tone. The film has been adapted into a book. Disillusioned, Ben attempts to imprison Sarah, but she tells him that only a Wiccan can defeat her, and imprisons Ben in a magical sphere. The gang launches an attempt to get the book while Sarah begins to turn pumpkins, trees, and a turkey into monsters in order to stop them. Daphne and Velma free the Hex Girls and Velma convinces Thorn to use her inherited Wiccan power to read the spell to banish Sarah into her imprisonment. However, Sarah manages to pull Ben in to make him suffer her fate with her, and they are both imprisoned inside the book. A burning branch falls onto the book, destroying it, ensuring that the Ravencrofts can never return. All of the monsters that Sarah had created have also returned to normal. The gang and townsfolk celebrate their deliverance with a concert from the Hex Girls with Scooby Doo and the gang (and the still-gigantic turkey) joining in on the performance. ^ a b "Scooby-Doo! and the Witch's Ghost". Amazon.com. Retrieved July 17, 2011. ^ "Scooby-Doo and the Witch's Ghost (1999)". Allmovie. Retrieved October 24, 2015. ^ Herman, Gail; Copp, Rick; Goodman, David (9 June 1999). "Scooby-Doo and the Witch's Ghost". Scholastic – via Google Books. This page was last edited on 15 February 2019, at 16:49 (UTC).